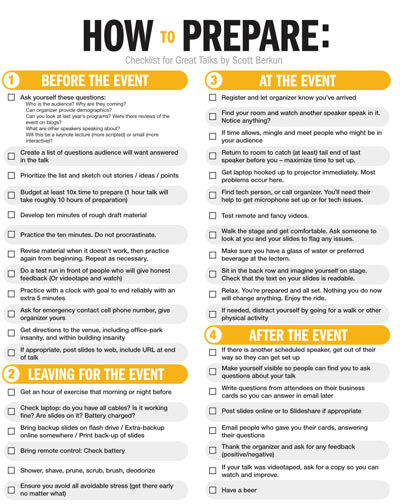 To help celebrate the recent release of the paperback edition of Confessions of a Public Speaker, as well as it’s 100th review on amazon.com, here’s a checklist you can use to help make sure things go well at your next presentation. Who is the audience? Why are they coming? Can you look at last year’s programs? Were there reviews of the event on blogs? What are other speakers speaking about? Will this be a keynote lecture (more scripted) or small (more interactive)? Practice the ten minutes. Do not procrastinate. Do a test run in front of people who will give honest feedback (Or videotape and watch). Practice with a clock with goal to end reliably with an extra 5 minutes. Get an hour of exercise that morning or night before. Check laptop: do you have all cables? Is it working fine? Are slides on it? Battery charged? Find your room and watch another speaker speak in it. Notice anything? Return to room to catch (at least) tail end of last speaker before you – maximize time to set up. Get laptop hooked up to projector immediately. Most problems occur here. Find tech person, or call organizer – you’ll need their help to get microphone set up, or to deal with any tech issues. Test remote. Test any fancy videos or fancy anything. Walk the stage. Get your body comfortable with the room. Run through your first few slides or minutes and ask someone to look at you, your clothes, and your slides to flag any issues. Make sure you have a glass of water or preferred beverage at the lectern. Sit in the back row for a few seconds, and imagine yourself on stage. Also check that the text on your slides is readable from back there. Relax. You’re prepared and all set. Nothing left to do. Nothing you do now will change anything. Either you prepared well or you didn’t. Enjoy the ride. If your talk was videotaped, ask for a copy so you can watch and improve. Richard I. Garber February 1, 2011 at 12:37 pm. Permalink. Jack Dempsey February 2, 2011 at 1:09 am. Permalink. I’ve decided 2011 is the year when I take a lot of the great personal conversations I find myself in and start sharing them on a bigger scale. That means getting better at this stuff…and another read of CoaPS…and maybe one more after that. This list is great. Thank you. Brian Teeman February 3, 2011 at 3:59 am. Permalink. Scott Berkun February 3, 2011 at 6:18 am. Permalink. It’s not too late if you are there early. You may at least have time to fix it for critical slides, like the slide with your contact info on it. Kirill Maximov April 28, 2011 at 1:46 pm. Permalink. Anita Fenton May 12, 2011 at 1:51 am. Permalink. Britta Wenske August 12, 2014 at 3:05 am. Permalink. Hi Anita, according to latest studies the optimal speaking time is 20 minutes. IF it is longer you need to pay attention to the 10-minute-rule: Change your audiences state every 10 minutes. Have them do something, show them something etc. derric June 28, 2011 at 1:26 pm. Permalink. 5) I fold all the right corners down to facilitate ease of page movement. I generally bring two copies, just in case. And, finally, I never staple the manuscript–I personally find it very distracting and unprofessional to watch someone fold a page under while speaking. Nitin Bisht November 15, 2013 at 12:42 am. Permalink. Have a beer …:) at the end you do it..
Gordon Sheppard February 12, 2018 at 8:28 am. Permalink.